Hi! 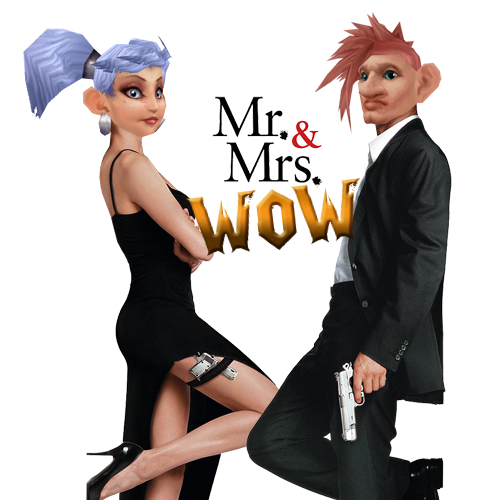 We are a British husband and wife team (Mr and Mrs B) playing World of Warcraft on Doomhammer EU. We established this blog shortly after Mrs B discovered WoW, a year after getting together with Mr B. This blog chronicals our time in game, our time with friends (both virtual and RL! ), our marriage, our falling out and falling back in love with the game, our gnomelets and how we negotiate gaming and parenthood. Occasionally, we do like to chat about our other gaming adventures, including Minecraft, Diablo and various tablet games. You can use the links on the right-hand side of the page to navigate towards your game and topic of choice. Mr B has been playing WoW since vanilla and considers himself a bit of a pro. His main past-times include levelling (and deleting!) alts and skiving off dailies. Although PvE is his main passion, his anti-social working hours means he’s becoming a bit PvP-mad, you’ll probably see him on a battleground fighting away! 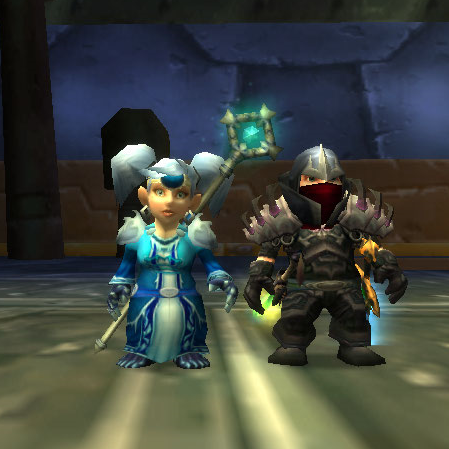 Mrs B has been playing since Cataclysm and past-times include obsessive achievement progression and when not exploring alts, can be found farming on her main, a Mage. She enjoys pet battling, transmogrification and exploring, although doesn’t profess to be expert in any. This blog explores our adventures as we game together as a married couple. All our opinions are entirely our own and we hope you enjoy following us on our journey together. We try to have an active Twitter presence – but please bare in mind we have two children under 2 years old and full time jobs, we can get a bit busy! Please get in touch for our battle tag; come and say hi in-game! This should be fun 😀 I’ll fallow u guys 😀 Just cuz i like to see more girls playing WoW, like me 😀 Wish u best! Hey there! This is Esmeralda Sky with the Casually Casual Cast and I am spotlighting your Blog this week on my Episode 8 ! You can listen from iTunes, Stitcher radio, and of-course http://www.casuallycasualcast.com! I love the concept of your sight and I am excited to read more! Wonderful – especially as you’re in the UK. If you happened to be in London, that’d be even better. Since your blog is well-written and has good content, I would like to put your blog in my “Blogroll” which I am about to add to my blog. I was also hoping you could review the content on my blog and consider adding my blog to your blogroll as well. And I have gotten my blogroll setup; your blog is on it! Thanks for the info on Isle of Giants! I fallowed your directions and got the flight path last night, and hope to explore today. Hey there! I love your blog, and I just find couples who play WoW adorable (since I experience it too hahaha) 😉 Nice to meet fellow WoW lovers, and one’s a vanilla player too *bows* haha 😀 I look forward to hearing about your WoW insights and adventures! Thanks for the comment 🙂 We are unfortunately unsubbed from WoW at the moment, but there’s plenty of back-dating you can do if you want to read about what we got up to, Will be back for WoD, but blogging other games in the meantime! Why did I just now visit your guys’ blog-blog? 🙂 I’ve been your twitter follower for like ever! I’d suggest adding Follow option to the side menu.